Day 1: Durban and let’s hit the road baby! Durban has a lot to offer to a regular tourist.. There is a beautiful port, aquarium, sea world. But all these places need a lot of commitment. Sikander said “if we go to the aquarium, it’s at least 3 hours there.” So we decided to skip that part. We have seen enough big aquariums for now. Food on the other hand was the biggest thing on our mind. It’s been a long time we had Indian street food and durban being the biggest Indian settlement outside of india, I wanted to have samosas and poori bhaji :). 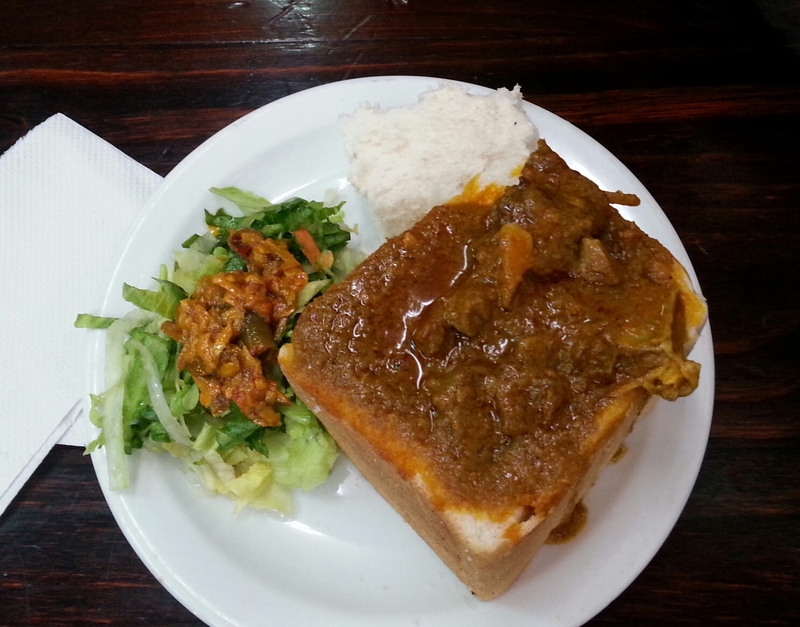 sikander wanted to have bunny chow – a durban Indian speciality where they serve mutton or chicken or veg curry inside a big bun. We went to Victoria Street market. It’s chaotic, but it’s the perfect place to buy souvenirs, if you are looking for some. Sikander had to buy a spear for his client… I was just looking at some knick knacks and picked up a few gifts for friends and family. In the shops we also spoke about our road trip plan and how is the route and what should be careful about. The main advice we got was to not drive at night on the highways. There are a lot of erratic taxi drivers at night and the chances of an accident are very high. After our shopping and lunch we walked back to hotel and as we were walking back we saw a flea market :). I picked up an African shirt, a friend had asked for. And then it started to rain. But not so much to need us to stop. We walked around the downtown area and came across a wall full of graffitis. Graffitis about rights – right to education, right to health, to fair trials, to equality.. It was quite interesting to sit and read through it all. Later I read it was part of a community wall mural project. 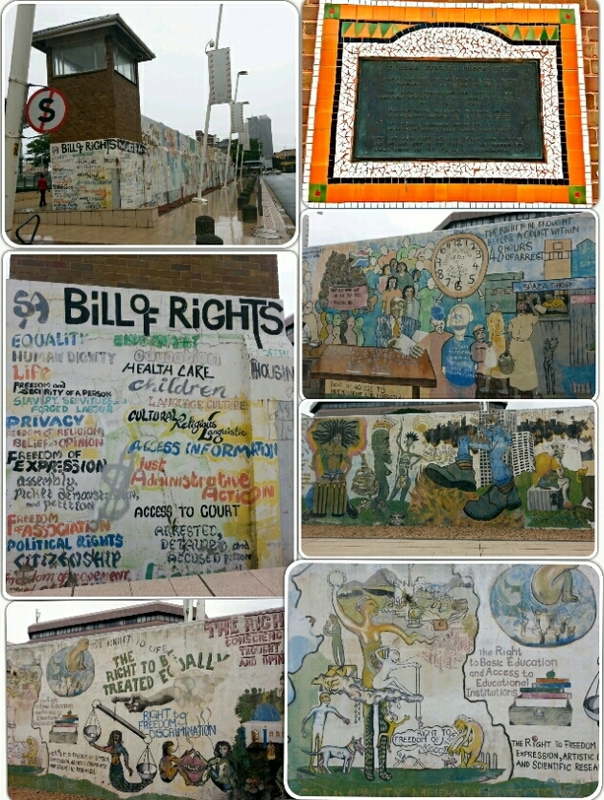 As we walked along the wall, at the end we came to a stone on which it said this wall was part of the durban central prison. It’s interesting how just this one wall from one light post to another has been preserved in between the swanky downtown as a reminder of the past. 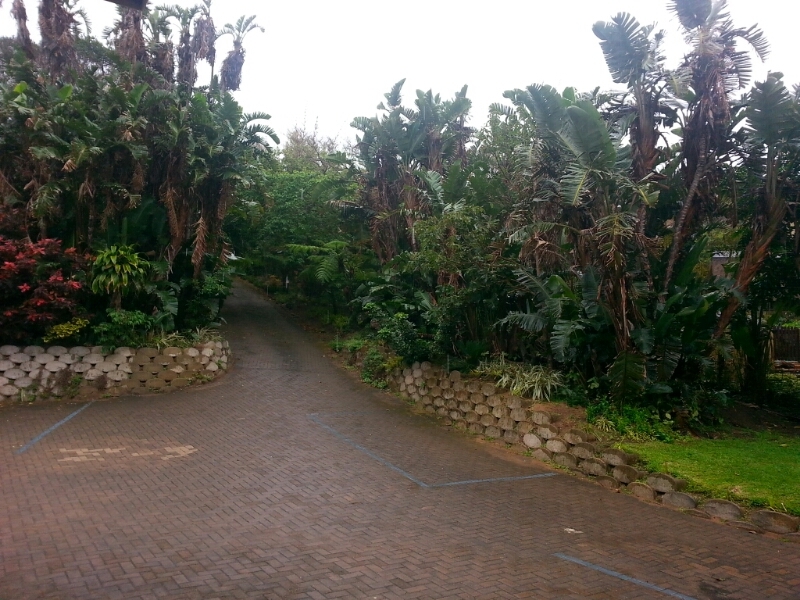 As we left from durban it was still raining and that added to the beautiful scenery all along the highway. At one point we left the highway and went on a parallel road inside that was along the coast. We had planned on doing only about 100kms for day 1 and stop for the day at a town called south broom. There were estuaries along the way and you could see the brown and the blue waters meeting. We entered into the driveway of our beautiful guest house – white shores. The hosts – Vivian and Trevor were there to welcome us and show us the place. And we had the whole house to ourselves for the night as there were no other guests! For dinner we went to a local bar called Mariners. It seemed like th place where all the local south broom people come for a chat at the end of the day, discuss their catch, have a beer. After an evening of drinks and dinner, we headed back to our room and to an early night. the bunny chow looks yumm! Yeah.. sikander really enjoyed his bunny chow! We loved the wall… more so the messages that were on it.. It was like a silent protest.